Inspired by the Hogwarts textbook written by J.K. Rowling's character Newt Scamander, Fantastic Beasts and Where to Find Them takes fans to a new era in Rowling's Wizarding World, decades before Harry Potter and half a world away. 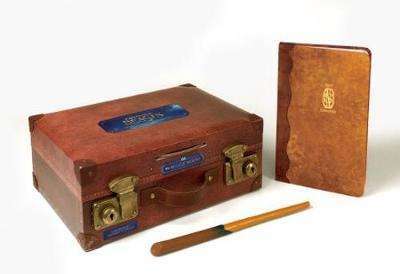 This deluxe enchanted replica of Newt Scamander's case is loaded with interactive special features to make any fan of J.K. Rowling's Wizarding World feel like a master magizoologist. Kit includes: Collectible replica of the case carried along on Newt's adventures, as packaging that doubles as a keepsake box, including metal closing clasps. "Muggle worthy" dial that allows the case to be opened in either no-maj or maj-friendly modes. In no-maj, a trick lid reveals mundane case contents, but in maj mode, further wonders are revealed: Sound activation: each time the case is opened, the sound of 1 of 7 different beasts is released. 128-page, 4-1/4 x 7-inch notebook including beasts encountered along Newt's journeys and field note illustrations. It's also your Fantastic Beasts-inspired journal, inviting you to describe beasts of their own invention with prompts such as "date of discovery," "feed codes," "terrain," and "habitat." Includes elastic band closure. Newt Scamander's wand pen.